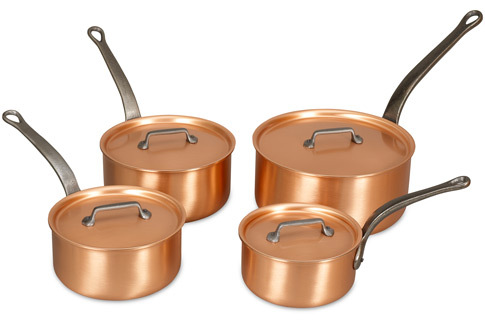 Our copper saucepan set is comprised of four of our most popular sizes with matching lids. Possessing straight high sides and flat bottoms for even heating and moisture retention. Copper provides the accurate temperature regulation that gives you greater culinary control. Durable rustic cast iron handles compliment the easy care brushed surfaces, exclusive to Falk products. The hygienic lining is permanently bonded to the solid copper body in Falk’s patented process which has become the industry standard. We know you'll love this	copper saucepan set	as much as we do. I could not be more pleased My dream come true. We were going to drive over to Villedieu-les-Poles in France to purchase Mauviel pans, but could not resist these prices! These are the "creme de la creme" of saucepans in my opinion. Thank you Falk Culinair. 1186 customers found this review helpful. Did you? Yes, I did!